Vitamin E is a well-described, fat-soluble essential micronutrient and, as such, must be provided to the human body on a regular basis to prevent deficiency symptoms and maintain a healthy status. 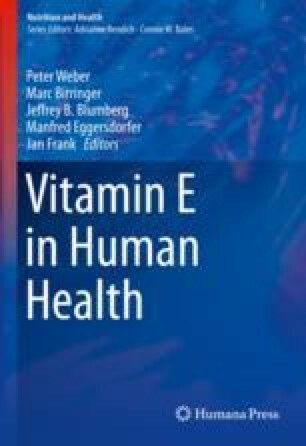 As vitamin E was discovered close to a century ago, there is a wealth of data about this vitamin in the public domain, reported in original research articles and reviews as well as in many books addressing its mechanisms of action and preclinical investigations as well as its benefits and safety profiles in human studies. So, one may ask: Why another book on vitamin E? Borel P, Desmarchelier C. Genetic variations involved in vitamin E status. 2016;17(12) https://doi.org/10.3390/ijms17122094.